Hyundai Forums : Hyundai Forum > Hyundai Models > Sonata Forums (Please Post In The Correct Sub Forum For The Year Of Your Vehicle) > YF (2011-2014) Sonata/i45 > How to reduce wind noise? I just had a new windshield installed and there is a lot of wind noise now. I guess it could be coming from somewhere else, but I don't remember hearing wind noise with my original windshield. Is there any way to reduce wind noise? I am not sure if the original was acoustic or not. Ill check tonight after work. But if you can post the Manufacture label of your current windshield that would help. My original windshield was great and the car was super quiet when I had it. The new windshield is an FYG brand... it looks identical to the original, but the wind noise is awful! If you need more info about the FYG windshield, let me know; I can look at the stamp in the lower passenger side corner. Run it thru a car wash and look for leaks. If you find any, get the windshield installation addressed. I certainly hope that FY aftermarket quality is good. But, the only way to tell is put two new windshields, OE and FY, side by side and look.... obviously beyond what most consumers can do. Yeah seems like it. I had a second gen Probe that had four replaced before they said flat out they can't install it correctly. It always leaked. It was a chore. My windshield is an OEM Limited and is not sound barrier. Last edited by Bearcats; Yesterday at 06:40 PM. I asked for a Pilkington and they told me that their supplier couldn't get that brand... that seemed a little weird to me. It's rained pretty hard here since the FYG windshield was installed, and there are no leaks. Just annoying wind noise. This is my second windshield installed by the same glass shop... the first one was a PGW and it was very distorted, it rattled, AND there was wind noise. The FYG windshield doesn't rattle and it's not nearly as distorted, but the wind noise is WAY worse. 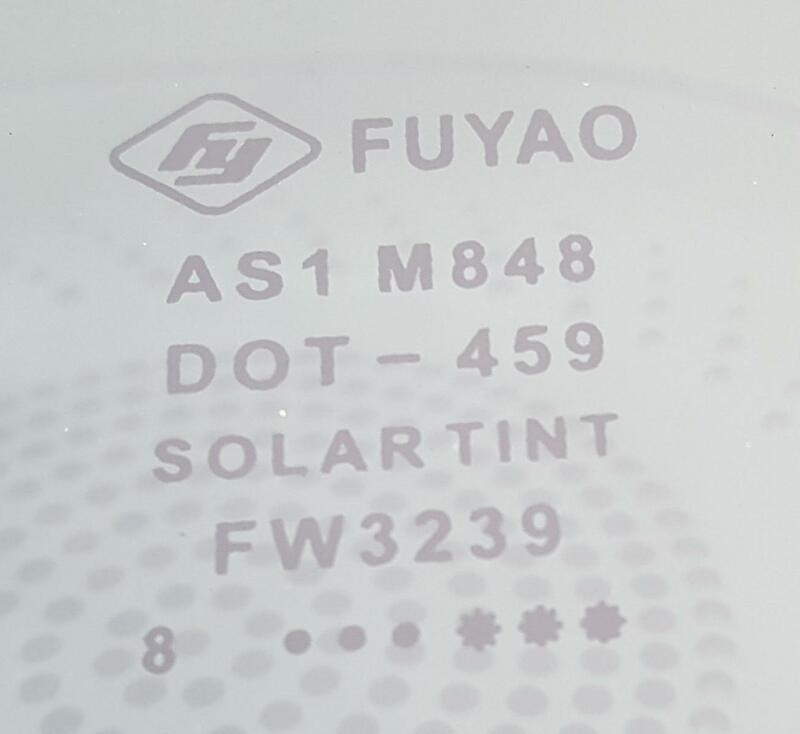 Okay, here is a pic of the manufactures mark on my windshield... I'm a little worried by the fact that it doesn't say "Laminated" on it. I have no idea if this is a quality OEM windshield or not... any advice? If you hear wind noise, like an air leak, slight whistle or wooshing noise, that is poor installation and it is not sealed. If you are just hearing more outside noise thatn usual, then that could be the glass. That just looks like a bare minimum windscreen that meets the basic safety standards. If Laminated is not on it...its not Laminated. It does pass the AS1 test. Laminated will impact sound. How much; I don't know. 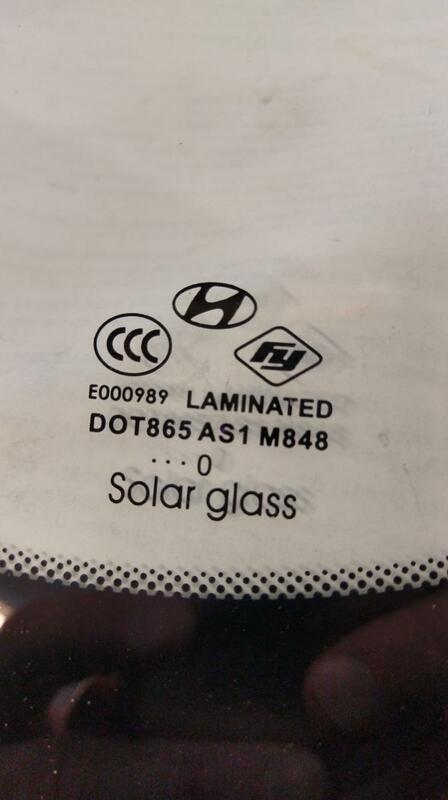 Laminated means that there is a nylon film sandwiched between the two layers of glass.